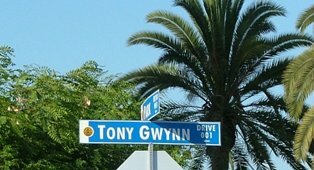 Tony Gwynn Drive - the man deserves the whole peninsula! Outside of the park - to me, sadly, this was the best part. Oh - I had to pour out my open water bottle before entering. ?!? 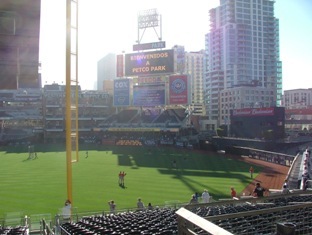 The field with San Diego in background. 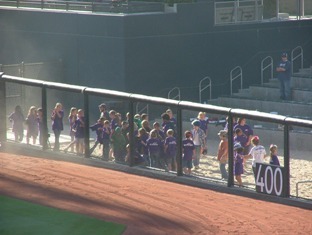 Will someone let these kids out? 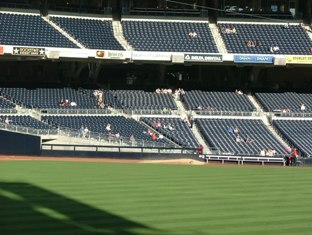 :-) They were waiting for home run batting practice balls. 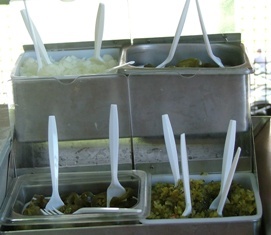 Ok - jalapenos out number onions 2 to 1, but they are all REAL! 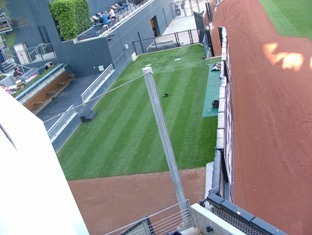 Family picnic and play area beyond left field. 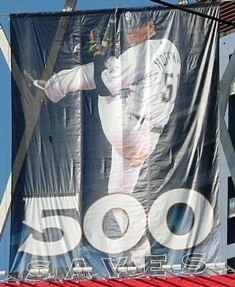 Nice poster of Trevor Hoffman. 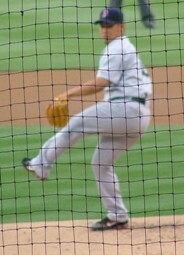 I didn't get to see him pitch. The game circumstances were never right for him to come in. The Padre himself... I just missed the chicken by 3 games... they were saving him for the game on July 4. 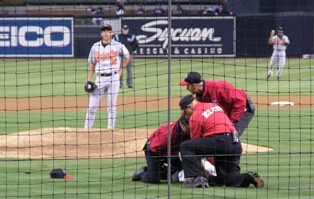 Actually it was a pretty boring game, until..... Yep - a guy ran out on the field and the security team tackled him. See - it was a pretty boring game.... and it wasn't even as close as the score. NOW FOR THE BIG MATCHUP!!! 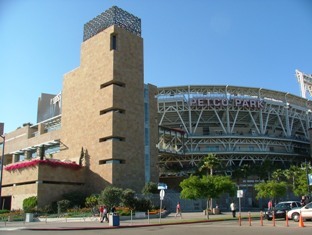 Red Sox vs. Padres! 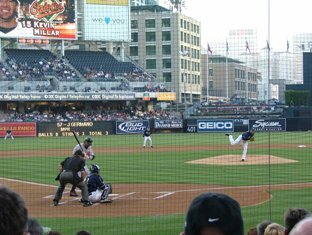 Dice-K vs. Maddux! It was 80s retro night. 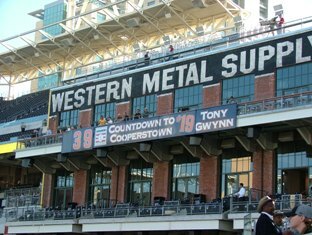 Even the scoreboard was in retro font. Big Papi after he took batting practice with an aluminum bat. 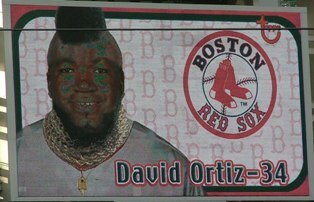 Big Papi as Mr. T.
Greg as... um... I guess they couldn't 80 him up. Dice-K. 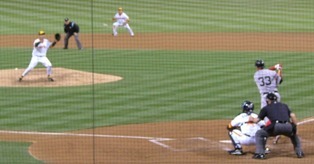 This is why he had early success - can't see the ball during the wind up. 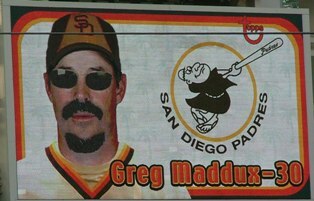 Ball hit back to Maddux. 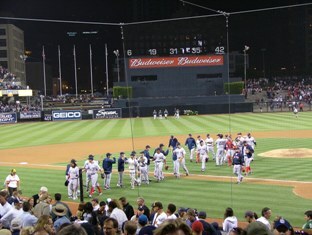 Final score - yep - I saw Maddux in person - Maddux lost.